Shirdi Sai Baba Devotee Hemanth Kollipara from India says : Sai Ram, my wife and myself we are married since seven years. We have not planned kids till recent past due to financial reasons (debts). But Baba has helped us clear them slowly by giving me a chance to work abroad. There is domestic pressure from our parents and relatives and doubts were expressed that we might have health problems as we are getting older etc (Nobody knows our financial situation). Our parents tried to take us to Doctors and even visited Astrologers without our knowledge. We have full faith on Baba. When we visited Shirdi in August, we prayed Baba to grant us whatever is good for us in His view. 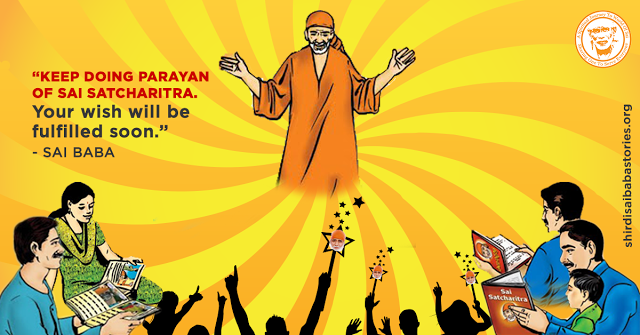 With Baba's grace, we could join Mahaparayan group and started reading Baba's Satcharitra since October. Two weeks after Mahaparayan, Ovulation tests showed negative results. Also we were travelling and were stressed due to various reasons. Approximately one month after joining Mahaparayan we visited Doctor and it was diagnosed that there is a Cyst and it has to be further diagnosed. We left to Baba and were not at all worried about that. Then After 7th week's Parayan, we visited the doctor again and she confirmed that my Wife is Carrying and there is no need to worry about the Cyst. We were not at all expecting such a news. It is Baba's miracle that such a negative news (Cyst) has been turned to a happy news.Thank You Baba for showering Your grace on us and we believe that You will take care of us and will do what is good for Your devotees. Thank you Hetal ji, Pooja Ji, Neha ji, our Class teacher Ramesh ji for organising Mahaparayan and all devotees for your sincere parayan. Om Sai Ram, may Baba bless us all with peace and prosperity. When we leave it to Him to decide what is best for us rather than telling Him to do something as we think as best; then best will only come to us for He is Omniscient. Above all when our Sai Holds our hands then do we have any need to show our hands to any astrologers? Love You Sai Maa. Jai Ho Sai. Congratulations Hemant ji. Sai Baba fulfill his devotees prays done with utmost faith n love. God bless your family. congratulations Hemant ji. Your true Shraddha & Saburi made your wish come true. May baba continue to shower his blessings on you and the baby. Om sairam. Babas miracle and your complete faith is admirable. Hearty congratulations to both of you.